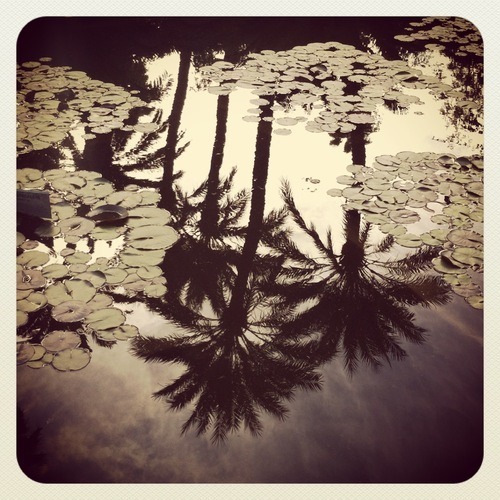 Our favourite Parisienne chic chick Miss Marion Boucard has curated two perfect days in the Marrakech – taking in the best of the sights, shopping and sundowners. Start your visit at the very heart of the city – Djemaa el Fna. The square, site of early public executions, is now a Unesco’s World Heritage site. Storytellers, serpent charmers, medicine men, musicians, dancers and acrobats were on strike when I visited (a French legacy peut etre? ), but it is a fascinating place any time of the day. In the evening the best sunset view is from the rooftop terrace at Cafe de France and later at night the great snack experience is to sample some of the offerings at the dozens of stalls,for super cheap lamb couscous or shish kebab. Souk: A trip to Marrakech wouldn’t be complete without a wander around the seemingly endless maze of markets. 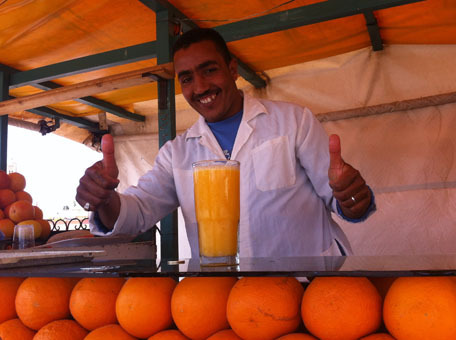 Three tips: don’t worry about losing your way, go for it – you will always find your way back to Djemaa el Fna; don’t buy anything the first day, just look at what you’d like to bring back home and inquiry about prices without succumbing (say ‘Tomorrow’ if the vendor becomes too insistent). Lastly, remember this word: « Baraka » meaning ‘God has given me enough, I’m fine’, this will help you to get rid of over-friendly locals. This medersa was one of the largest theological colleges in North Africa, for unto 900 students. It was founded in the 14th Century by the sultan Abu Al-Hassan, enlarged in the 16th Century and polished up in the 90s courtesy of the Ministry of Culture.The beautiful, ornate main courtyard is partly built in cedar marble and stucco. The carvings covering the walls have no representation of humans or animals as required by Islam and consist entirely of inscriptions and geometric patterns. At the far side is the domed prayer hall with the richest of decoration, notably around the mihrab, the arched niche that indicates the direction of Mecca. Two flights of stairs lead to 130 student dormitory cells. It is playful and fun to wander inside them, especially when you suddenly hear the call of the muezzin at the nearby Ben Youssef Mosque. An immersive show would be amazing there! 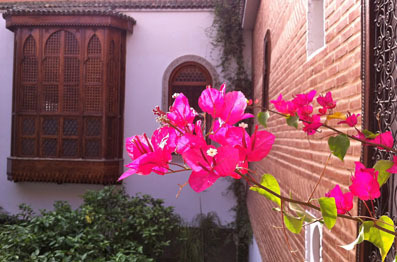 Inaugurated in 1997, the Musée de Marrakech next door is housed in a converted early 20th-century house. Take a look at the great tiled central court, roofed over and hung with an enormous chandelier, the star piece of the collections on display. A few steps away from the Museum exit on the left is Jabrane’s shop. He sells quality vegetable silk plaids and blankets at a decent price. What’s this vegetable silk ? Cactus silk or Sabra silk is a luxurious fabric made from the Agave Cactus. 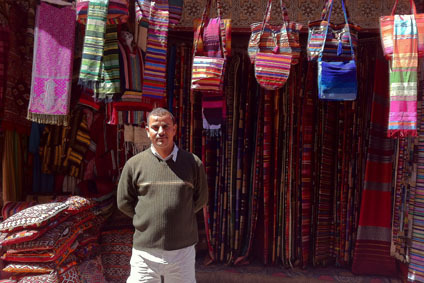 It is hand-loomed in and some of the products are created with strips of the silks alternate with goat or camel’s wool. Some have Chenille, and cotton yarn in contrasting colours which enhances the amazingly vibrant, almost metallic shine of the cloths. 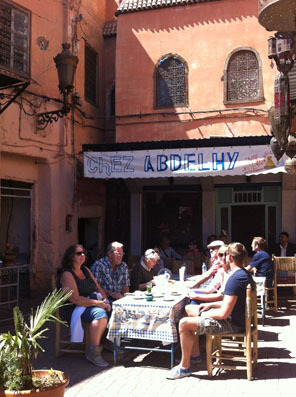 Just a couple minutes from the Medersa enjoy a typical Maroc lunch: no menu, the plates come straight to you. Lentils, vegetable tagine and finally a plate of roast meat on sticks, all in abundance and very good. 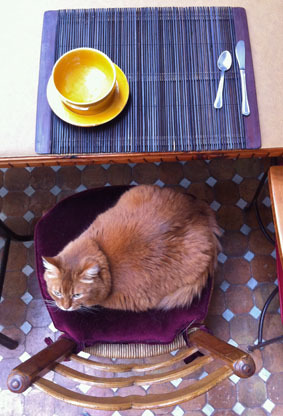 Be ready to share your table with locals, a few tourists and occasional feline guests. Bespoke babouches for 10 Euros? In this tiny picturesque boutique, pick your favourite colour from a large selection of calf or goat skins and Reda will deliver the perfect pair of babouches a few days later (make sure you stay long enough…). Of course he has other styles on display and will be happy to copy a favourite pair of yours. 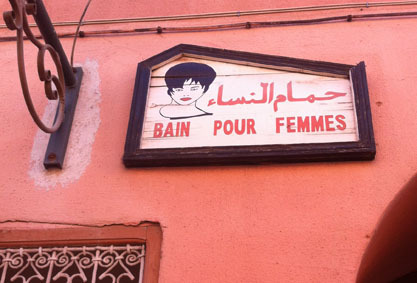 Kermous is a sweet man and entering his shop instantly transforms you into Ali Baba seeking the magic lantern. 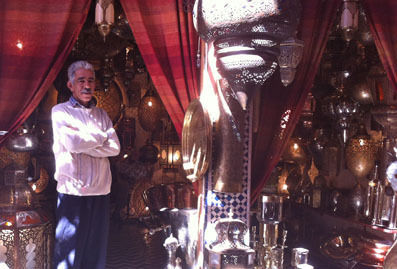 Many many handmade tin and copper lamps awaits you there, from Art Déco to traditional punched metal Maroccan style. 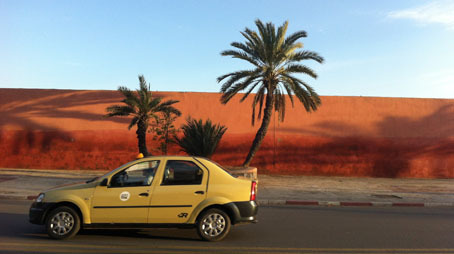 Escape from the frenetic and vibrant Medina. For a long time the Mamounia, stood alone as a temple of Viennese Art Deco splendour, with grand halls, elegant restaurants, luxuriant gardens, spa, pool and elegant casino. 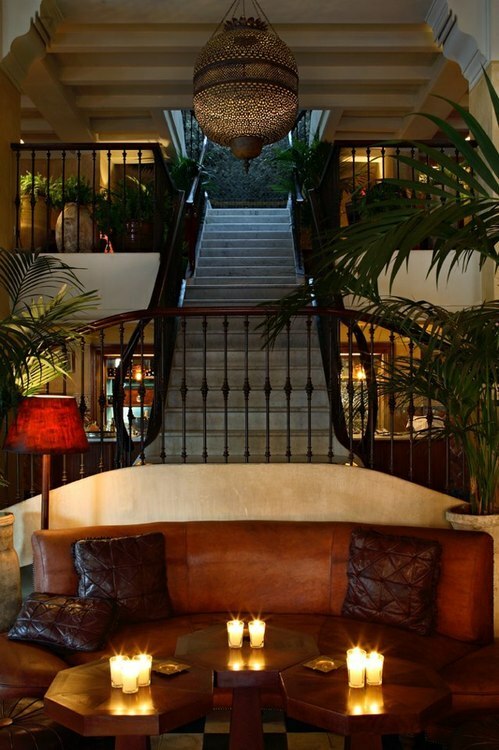 Recent renovations give the 171 air-conditioned rooms and 57 suites a warmer, more Moroccan ambience. The garden itself is worth a look (and free to visit as long as you are dressed appropriately). 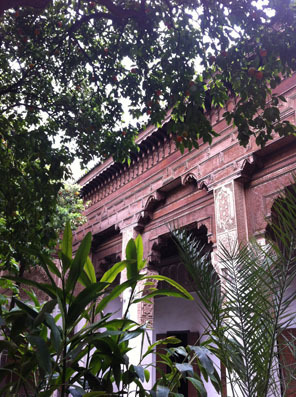 It is as green as a Norman orchard topped of with palm trees and surrounded by the ochre city wall. Super relaxing. 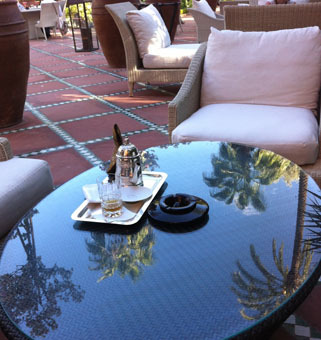 Wether you indulge in a mint tea at Delice square right in the middle of the park or a glass of champagne at one of the other terraces, you shall be offered everything you expect from luxury: serenity, distinguished service and a backdrop of birdsong. An Evening in GUELIZ – the ‘new’ city – where most people work, live, and party. 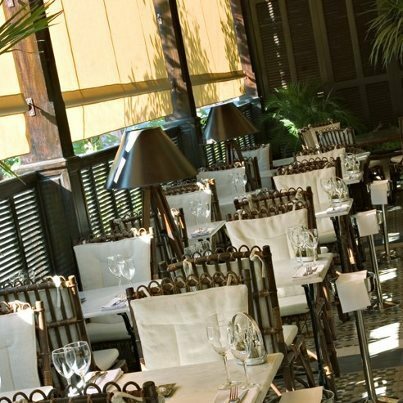 A sumptuous 30s French colonial brasserie serving French and local dishes. They hold literature lectures once a month – check their Facebook page for dates. 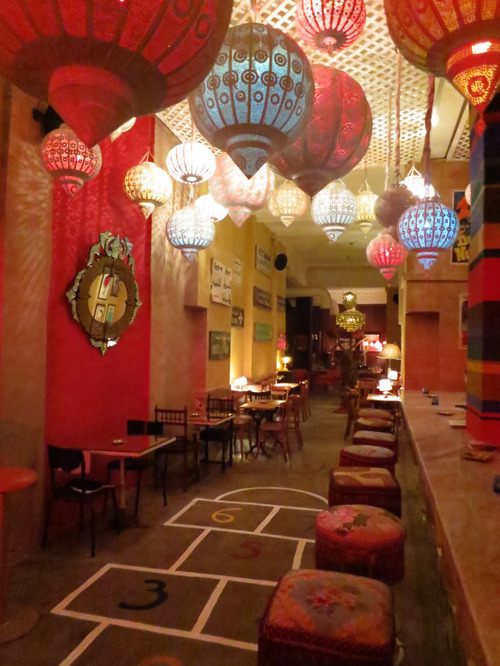 Only a few months old – the decor is eclectic with a permanent hopscotch painted on the floor. Just the way we like it. Montecristo – for live concerts go to Sinatra on your left, for crazy local electro music that’s Baoli on your right. There’s also a skybar if you prefer to look at the stars. Oscar – late night club with local artists palying music (you may have to enter with a local). Early bird catches the quiet worm. 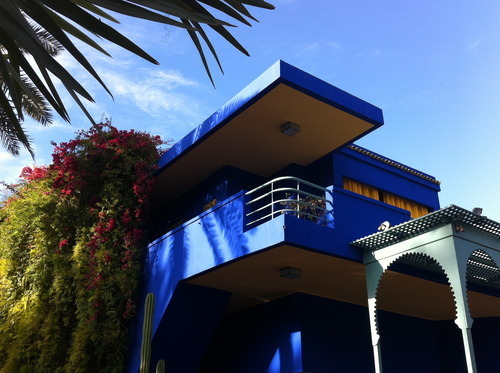 This ‘vertical’ garden was made in the 1920s by the French painter Jacques Majorelle, with marble pools, raised pathways, banana trees, groves of bamboo, coconut palms and bougainvilleas. As the garden was designed by a painter, it is composed and coloured like a painting. 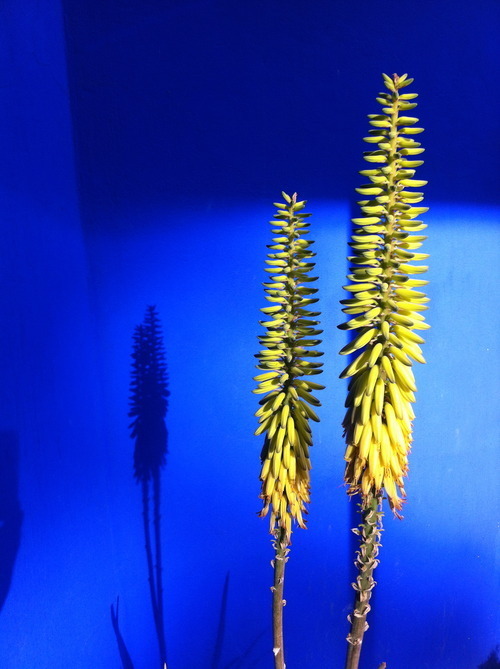 Many of the built features were painted in a dark blue (‘Majorelle Blue’) or bright yellow which contrasts with the soil, climate and plants. After years of neglect, the garden was then taken over in 1980 and restored by the fashion designer Yves Saint Laurent and his partner Pierre Berge. 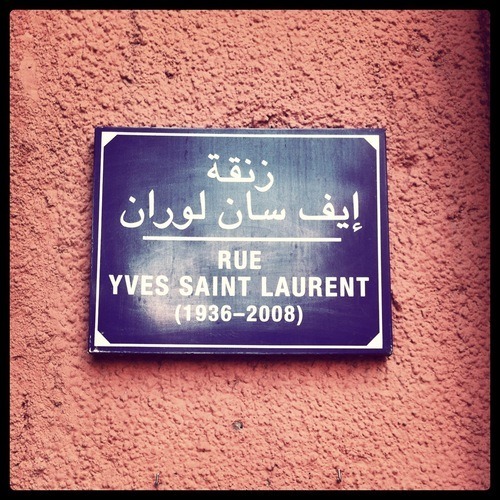 After Yves Saint Laurent died in 2008 his ashes were scattered in the grounds. 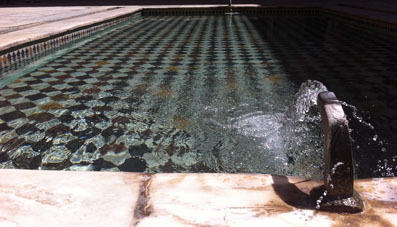 Another must-see is the highly curated Islamic Art Museum of Marrakech, located within the garden’s grounds. The collection includes Northern African textiles, traditional kilims of Arabic and Berber design, pottery, jewelery, ceramics, furniture, paintings and two large doors from Yves Saint-Laurent’s personal collection. You can have an early LUNCH at Café Bousafsaf or head back into town. 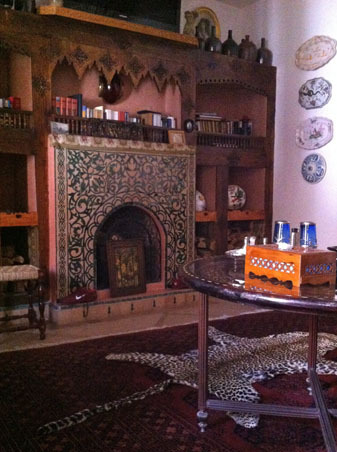 It was built in the late 19th century by Si Moussa, grand vizier of the sultan to serve its personal use. In fact, the palace also bore the name of one of his wives. His harem was located here, and it included an enormous court decorated with a central basin with the concubines dwelling in a series of surrounding rooms. 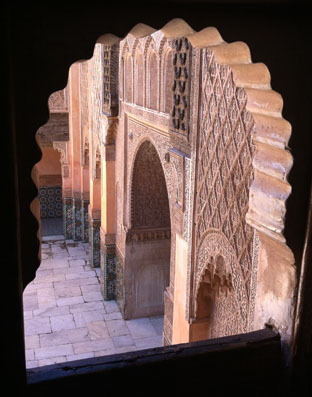 It is truly a cultural treasure trove, offering glimpses of a Moroccan kingdom’s former opulence as well as its eye-catching craftsmanship. 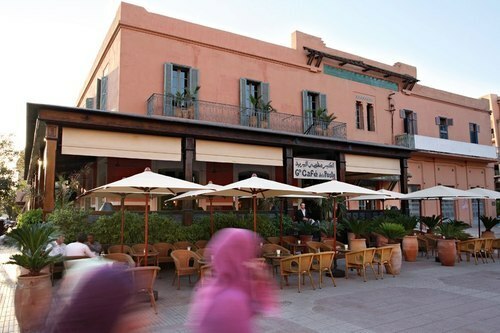 Take a walk to the spice market two minutes away. 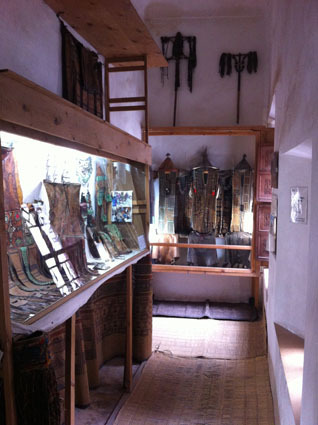 If you have became an Arabic craft addict, visit the nearby Musée Tiskiwin, a private house owned by veteran Dutch anthropologist Bert Flint. The exhibition is designed to show Morocco’s connection to sub-Saharan Africa and is geographically laid out to take you on a virtual journey across the Sahara to Timbuktu. Exhibits include masks from as far afield as Mali and a large selection of jewels. The display is poor compared to the visual efficiency of the Islamic Art Museum (Majorelle): this is clearly not a glass case type of museum (some displays are verging on hilarious), on the other side, you’ll be on your own to discover it’s many treasures. 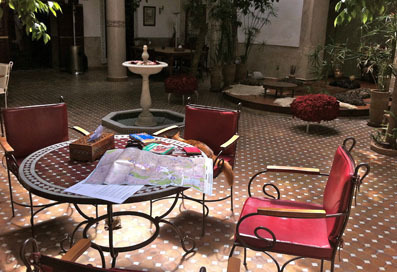 Hidden in a back street of Assouel (North of the Medina), I thoroughly liked the tranquillity and comfort this lovely riad offers, from the fountain and orange tree in the courtyard to the menorah-adorned salon (the marmelade served for breakfast is made from these very trees!). 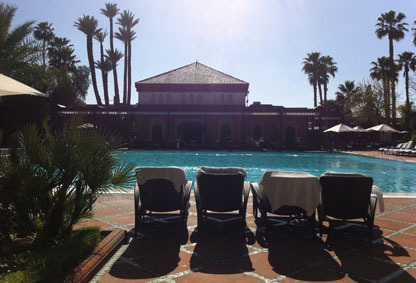 Every morning for my daily meditation I enjoyed the gaze at the mountains and Koutoubia from the panoramic roof terrace. Five spacious rooms and a suite are beautifully furnished with bright Berber rugs, antique hand-painted furniture, and large bathrooms with mosaic showers and lacquered walls. I felt like a princess. Owners and staff are exceptional hosts providing invaluable assistance and advice to get the best from the city and beyond. An elegant candlelight dinners is served on demand, also the Hamman (solo or couple) will be prepared at your request.